TIMES: All classes start at 6:00 PM and end at 9:00 PM. HOW MANY CLASSES YOU NEED TO ATTEND: It has come to our attention that some people have the idea that we cover the whole book in each class session. That is NOT the case. If you want to cover all the material in the book (that is, all the material on the test), you will need to attend all of the class sessions. Each class session covers only part of the material in the book, just like a normal college course, moving on until we finish all the material on the last night of class. And, like college, if you are unable to attend all of the classes, you can try to make up the shortfall with self-study, but you will likely have a lower chance of passing the test than if you had attended all sessions. The more class sessions you attend and the more time you spend studying, the better your chances of passing the test, but it's up to you. COST: There is no fee for the class. However, we do need to collect an FCC-mandated fee when you take the test. The fee is currently $15.00. This may or may not change in 2019. The test is administered at what hams call a VE Session. This is offered ONLY on the last day of each class - see the schedules below. VE stands for "Volunteer Examiner" since the hams who administer the tests are unpaid volunteers. Below is detailed information on what to bring to a VE Session; you can click here to see it. You will need to purchase your own textbook. Be sure to get the current edition listed below as all other editions are obsolete due to question pool changes. You do NOT need to enroll or pre-register or contact us in order to attend. All you have to do is get the book and show up at the class. You should have gotten your book before the class starts. Books can be obtained from arrl.org/shop, hamradio.com, Amazon and other vendors. The specific books you need are listed below with each class. The Technician license is the starting point. It is the first level of ham radio licensing and allows you to talk on frequencies 50 MHZ and up. These frequencies are generally local/regional. Most car-mounted and handheld ham radios use these frequencies. 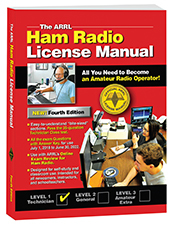 TEXTBOOK FOR TECHNICHAN CLASS: ARRL Ham Radio License Manual, 4th Edition. DO NOT try to use older versions of the book as they are obsolete. Make sure you are using the 4th edition. DATES FOR TECHNICIAN CLASS: March 5th, 7th, 12th, 14th, 19th, 21st with the VE Session on the 22nd of March, 2019. The General Class license is the second level of ham radio licensing. With this license, you can use all ham radio bands. Some of these bands allow you to make radio contacts all over the world. TEXTBOOK FOR GENERAL CLASS: ARRL General Class License Manual, 8th Edition. DO NOT try to use older versions of the book as they are obsolete. The cover of your book may not exactly match the cover of the latest printing shown below, but do make sure you are using the 8th Edition. DATES FOR GENERAL CLASS: April 2nd, 4th, 9th, 11th, 16th, 18th, 23rd, with the VE session on the 26th of April, 2019. A photo ID (no ID, no test, no exceptions! ), two pencils, two pens (black or blue ink), a non-programmable calculator (cell phone apps are not allowed), and the test fee, preferably a check or money order made out to "ARRL VEC." If you must pay with cash, please bring EXACT CHANGE ONLY. We do not give change at our VE Sessions. If you give us a payment of more than the test fee, the extra money will be considered a donation to SHARP. SHARP is an IRS-registered charitable organization, so you can deduct on your tax return any donations you make to SHARP. With that in mind, "Benjamins" are encouraged, but you have been warned! 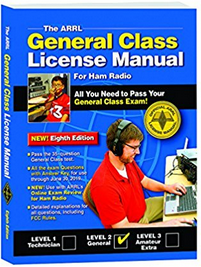 If you already have a ham radio license and are upgrading your current license to General or Extra, you must bring a copy of your current license. We will be keeping that copy (we turn it in to the ARRL along with test papers), so don't give us your only copy! A "Reference Copy" printed from the FCC web site is fine. If you do not yet have a license (when you are taking the Technician test), this does not apply. You must provide a working postal address. The address you supply will be published on the FCC web site (and many other ham sites will pick it up). If this is an issue for you (such as if you are a peace officer), then you might want to consider using an address other than your residence such as a PO box or your work address. If you are applying for your first license, you must supply your SSN on your test papers. If you have concerns about doing this, you can go to the FCC web site and obtain an FCC Registration Number (FRN) and use that on your test papers, instead. If you are upgrading your license, you will already have an FRN (it is printed on your license) and will use that on your test papers. I PASSED THE TEST. WHEN DO I GET MY LICENSE? That is completely out of our control, and is up to the ARRL and the FCC. We normally give VE sessions on Friday nights and post the paperwork Saturday morning. We've had licenses appear as early as the following Tuesday and as long as two weeks after the VE session. Most of the time licenses appear the following Thursday (six days after the VE session). 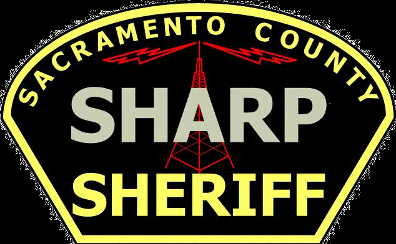 Technician licensees must wait until they receive their licenses, but those successfully upgrading to General or Extra can start using their new privileges immediately by adding /AG or /AE (pronounced "slant AG" or "slant AE") to the end of their call sign when ID'ing their transmissions.